Macallan has unveiled Special Edition No 3 – an aroma-focused single malt made in partnership with British perfumer Roja Dove – which forms the latest in its annual Edition series. With a global release of 250,000 bottles, the expression follows 2016’s Edition No 2 – which marked a partnership with Catalan restaurant El Cellar de Can Roca. The crafting of Edition No 3 saw Bob Dalgarno, master whisky maker at Macallan, work with Roja Dove of Roja Parfums to create an expression they intend to ‘showcase the complexities’ of single malt character. Using his sensory knowledge, Dove nosed and described distinctive aromas in particular oak casks, which Dalgarno then used to select whiskies to created Edition No 3. Selecting a combination of American and European oak, Dalgarno used smaller casks to create a greater contact between the spirit and wood, resulting in a ‘sweet and fruity’ character that brings fresh oak to the fore. Dove, in turn, praised Dalgarno and drew parallels between the arts of creating both whisky and perfume. ‘From the beginning it was obvious Bob and I had a lot in common,’ said Dove. ‘We have worked together to master the balance of taste and aroma, resulting in an incredibly flavoursome, fresh and citrus whisky with enveloping sweetness. 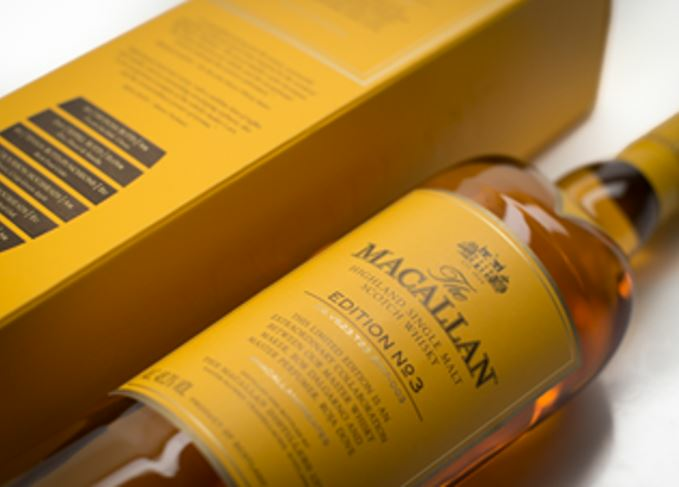 Bottled at 48.3% abv, Macallan No 3 will be available globally, priced US$95 (approx £73).